In March, students receiving nutrition education from UC CalFresh were able to try a juicy, tart grapefruit! For many students, it was their first time trying it, and we received a lot of feedback from them. Mrs. Stearns' transitional kindergarten class at Easterby Elementary School reflected on their tasting by turning it into art. Take a look at their creative artwork and opinions in the pictures below! 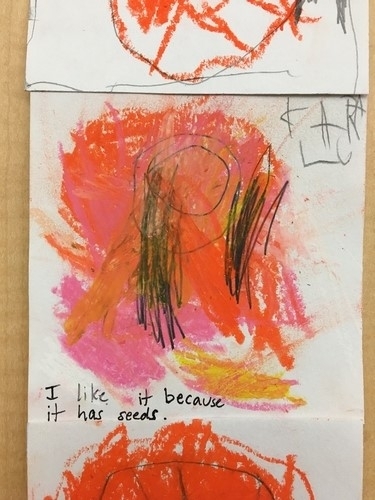 "I like it because it has seeds." 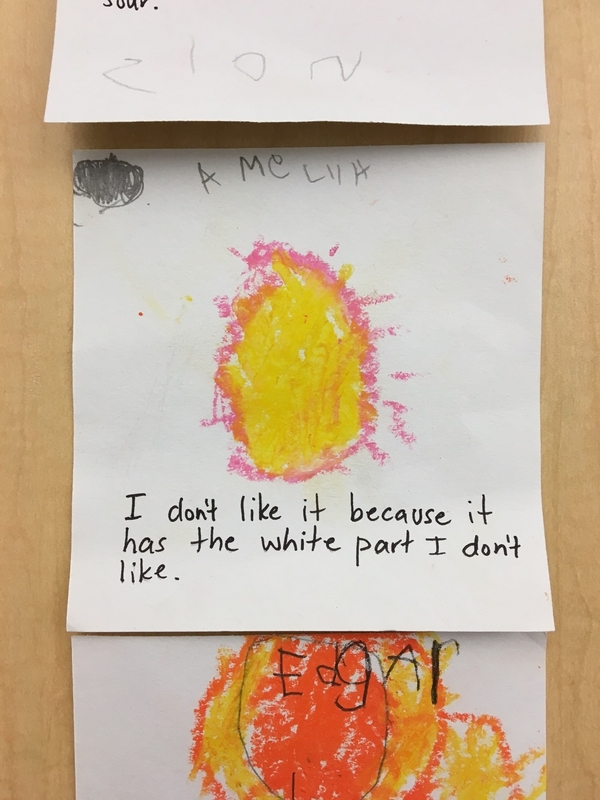 "I don't like it because it has the white part I don't like." 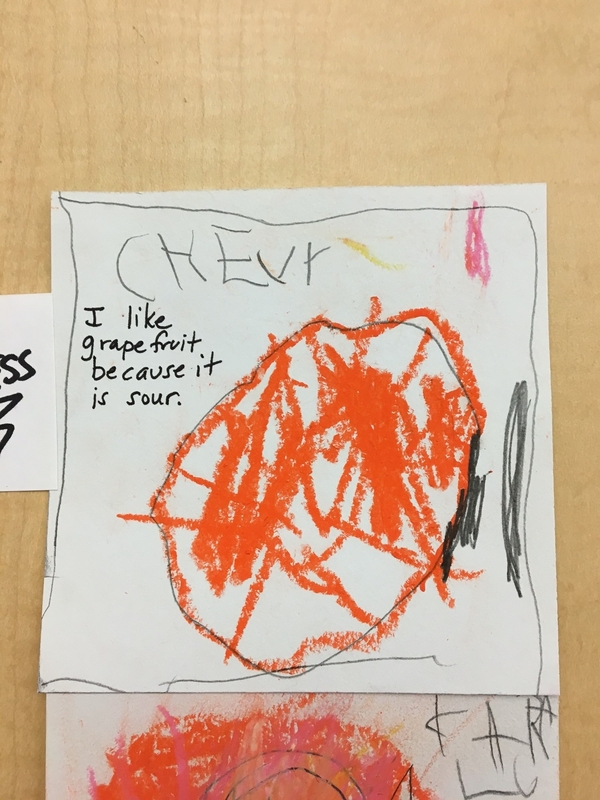 "I like grapefruit because it is sour." As we can see from their artwork, grapefruits were a hit with some students, while others weren't a big fan. Whether students liked it or not, it's wonderful to see that they were all willing to try it! Teaching children to be open to new foods is such an important part of creating a healthy diet, and Mrs. Stearns' kiddos are off to a great start! "What did you bring for us to try today?" This is the question I'm asked by my students in every class that I teach nutrition lessons. Tastings are brought throughout the school year for students to try new, healthy foods. It is the goal of UC CalFresh to give different types of tastings that come from the five food group on MyPlate for the students to sample. 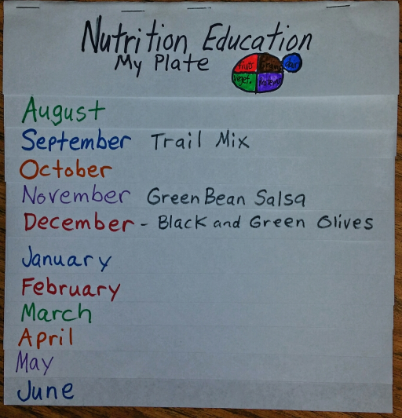 During the school year, I would always reference MyPlate with the tastings that the students were getting for that month. This gives them an idea which food group each tasting belongs to. 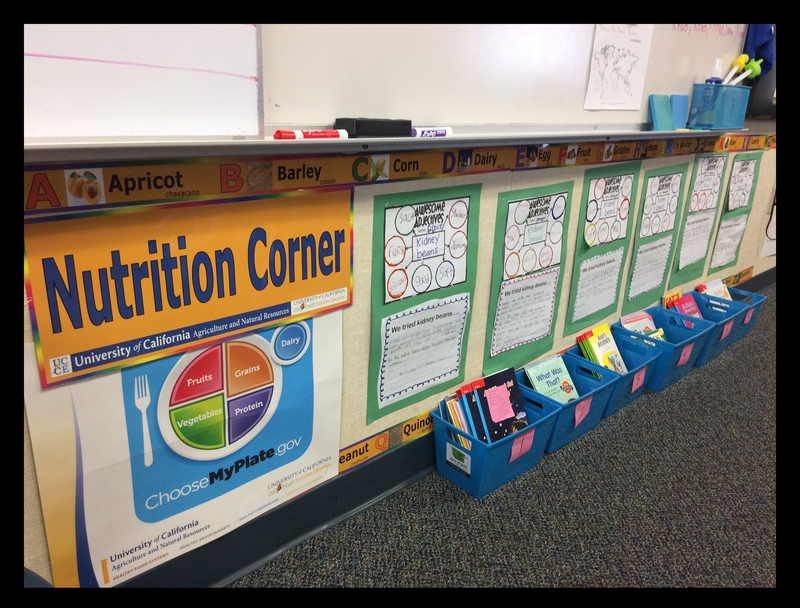 Many teachers created nutrition corners based on the different tastings the students tried during this school year. One of the teachers who did so was Mrs. Thao at Bakman Elementary. 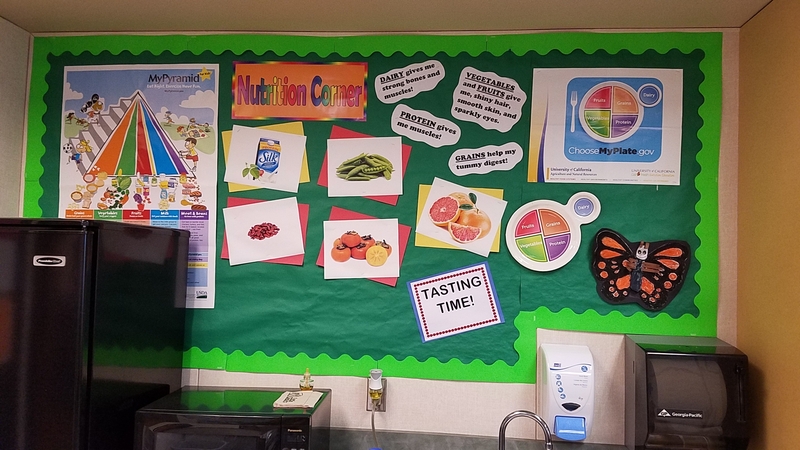 Mrs. Thao went over the tastings with the students and then posted pictures of each tasting on the nutrition corner to remind the students of the great foods they were able to try through the UC CalFresh Nutrition Education Program. Each time I visited Mrs. Thao's classroom, the students would remind me of what food they tasted, and tell me how much they enjoyed it or didn't enjoy it. Of course, all of the feedback from the students is great to help us improve our tastings for them to try in the future. "What will we bring for them to try next time?" Last month students in our program tasted grapefruit! This gave students the opportunity to explore the differences between an orange, a lemon, and a grapefruit. They were able to taste and see the differences in flavor, color, size, shape, and texture, and they wrote about their experience. During the tasting the students had lots fun! Thank you, teachers, for helping your students experience a new food. Check out all the foods our students have tasted this year on our website. Have you ever wondered how to enhance a food tasting? In Madera Unified School District, Mrs. Nava decided to make an English assignment activity with a nutrition twist for her 2nd grade class. The English assignment consisted of the students getting into groups to come up with adjectives that described what they thought of the kidney bean tasting they tried in November. Once completed, the assignment was displayed on their classroom's Nutrition Corner. Trying to fill a nutrition corner with student work or activities doesn't have to be too difficult or take up too much time out of your day. Ideas can sometimes be as easy as combining the assignment you had originally planned, but altering the topic or theme. Who doesn't like to talk about food? Are you a teacher enrolled in the UC CalFresh Nutrition Education Program? Has your class completed similar nutrition assignments? Taking Tasting Time to the Next Level! UC CalFresh offers monthly tastings for our teachers and students. During this time, students are given the opportunity to try a food that they have never tasted before. Why not add additional learning opportunities into your next Tasting Time?! Ms. Alcala and Mrs. Lopez's class took their tastings to the next level by incorporating writing and math skills. 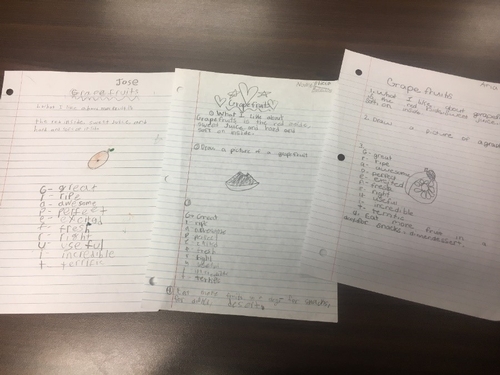 Mrs. Lopez's 3rd grade class at Rowell Elementary is creating and writing their own "Tasting Time" booklet. The booklet includes their descriptions and opinions about each tasting. Ms. Alcala's T-K class at Brletic Elementary practiced writing their names. They also learned to count the names and add the numbers together. 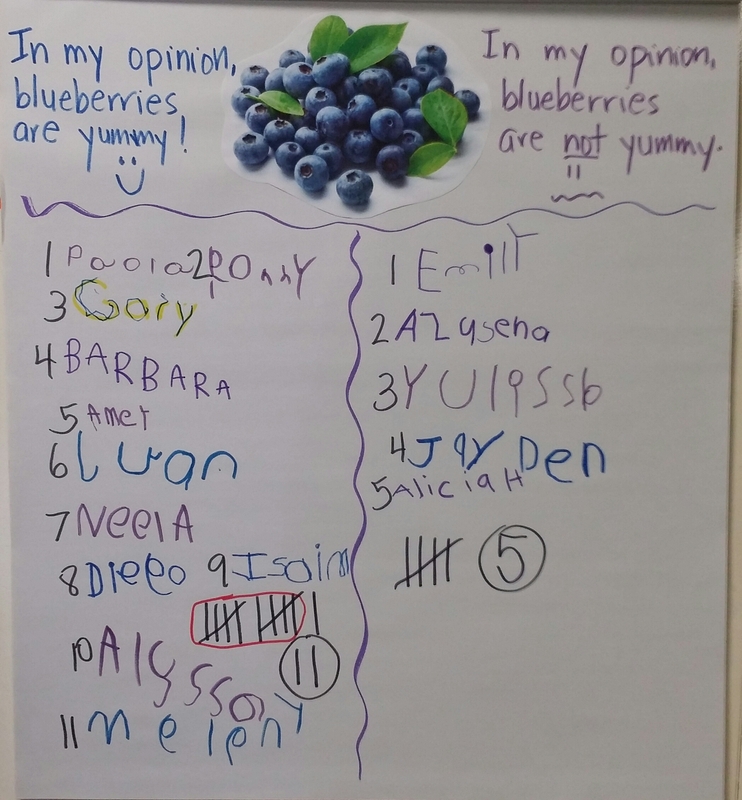 Tell us how you incorporate math and writing skills into your classroom's tastings in the comments below.